Monolithic Ceramics Market size was estimated at over USD 17 billion in 2016 and the industry will grow by a CAGR of around 7% up to 2024. Rising worldwide electronic device demand will drive the global monolithic ceramics market during the forecast spell due to its extensive application in the manufacturing of capacitors for devices such as laptops, phones, televisions, cameras, etc. On an average, more than 700 monolithic ceramic capacitors are used in a notebook device, while around 230 are used in a mobile phone. The global electronics industry has been witnessing a robust growth and will be valued at more than USD 3 trillion in 2024. Global mobile phone shipment is likely to rise from 1,400 million units in 2016 to around 2,500 million units by 2024 This growth has been fueled by the rising popularity of smartphones and other devices such as laptops, notebooks, etc. and will augment the monolithic ceramics market during the forecast spell. Asia Pacific has turned into a hotbed for the electronics industry with high production as well as demand for these devices. Rising per capita income and a steady GDP growth in this region has resulted in a robust demand for smartphones and laptops which will propel the global monolithic ceramics market growth till 2024. Asia pacific smartphone user penetration as percentage of total population will increase from around 30% in 2016 to more than 50% in 2024, while the number of mobile phone users is likely to rise from 2.6 billion to 3.1 billion in the same period. North American and European electronic manufacturers are also increasingly outsourcing their production activities to Asia Pacific owing to low labor and raw material cost. This will drive the product demand for the electronics industry in Asia Pacific and will contribute to the global monolithic ceramics market growth during the forecast timespan. High energy costs associated with the manufacturing process of these ceramics may hamper the monolithic ceramics market. The product is manufactured in a controlled environment which requires a very high temperature resulting in increased energy consumption. The processing cost is also higher due to the time-consuming nature of the manufacturing process. This increases the cost of the product and makes it difficult for manufactures to attain competitive pricing in the market. This may restrain the entry of new players in the industry and will hinder the product market growth during the forecast spell. Based on product, the global monolithic ceramics market is segmented into oxides and non-oxides. Oxides segment accounted for close to 60% of the monolithic ceramics market in 2016 owing to its extensive usage in the electronics & electrical industry. This product segment’s demand is fueled by its wide applications in the manufacturing of capacitors needed in electronic circuits and devices. Capacitors made using oxide types are smaller in size and has larger capacitance than the conventional ones. Other advantages such as better frequency characteristics and resistance to abnormal voltage will also boost the product demand in the electronics industry during the forecast timeframe. Non-oxides such as carbides and nitrides are extensively used for their temperature and corrosion resistant properties. Non-oxide monolithic ceramics market will experience healthy growth of around 7.5% CAGR during the forecast timeframe. This growth will be chiefly propelled by its increasing usage in automotive and aerospace sectors due its favorable properties. 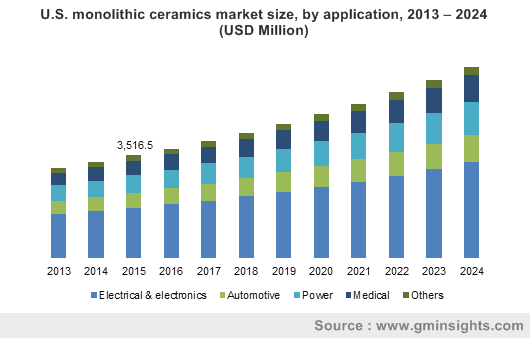 By application, the global monolithic ceramics market is segmented into five categories including electrical & electronics, automotive, power, medical, and other applications such as defense, chemicals, plastics, etc. Electrical & electronics is the major application segment and occupied more than half of the product market in 2016. The product is extensively used in the electrical & electronics sector owing to its unique mechanical and physical properties This segment will grow by more than 7.5% CAGR during the forecast timespan. The product is also employed in the power generation sector in the manufacturing of gas turbine components, high temperature heat exchangers, and turbine rotors. This segment of the monolithic ceramics market was valued around USD 2.5 billion in 2016. High temperature strength and resistance to creep & corrosion will increase the product demand for the power generation sector and will contribute to the global monolithic ceramics market growth. North America held more than a fifth of the global monolithic ceramics market in 2016 and will gain the industry at a significant rate during the forecast spell. The regional market’s growth will be boosted by stringent environmental norms which will lead to rising product demand in pollution control equipment. Developments in the U.S. power sector will also augment the North America product market development. Europe monolithic ceramics market registered a revenue above USD 4.5 billion in 2016. The regional markets growth will be driven by the rising electrical & electronics industry in Germany, Netherlands, and the East European countries including Czech Republic, Austria, Hungary, Poland, etc. Product usage in the medical sector will also fuel the Europe market growth till 2024. The presence of several large and medium scale manufacturers characterizes monolithic ceramics market competitive landscape. These companies focus on extensive R&D activities in order to expand their product portfolio. Strategic merger and acquisitions in order to expand the company reach into different regions and end-user sectors is also common in the industry. The major players in the monolithic ceramics market include Advanced Ceramics Manufacturing, CeramTec, CoorsTek, Inc., Ceradyne, Elan Technology, Morgan Advanced Materials, McDanel Advanced Ceramic Technologies, Kyocera Corporation, Saint-Gobain Ceramic Materials, Rauschert, Murata Manufacturing, Corning Inc., Pingxiang Yingchao Chemical Packing, Pingxiang Nanxiang Chemical Packing, and Pingxiang Xingfeng Chemical Packing. Ceramics which are composed of a single chemical compound are termed as monolithic ceramics. It is a major product type of the advanced ceramic materials. The product is widely used in capacitors where it acts as a dielectric. 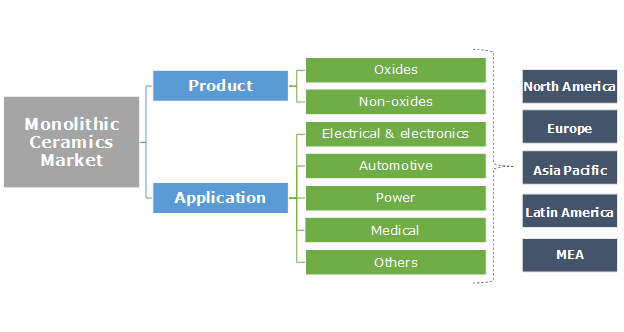 It is also used as catalyst supports for automotive and stationary emission control equipment. The most commonly found product types are silicon nitride, zirconium carbide, zirconium oxide, aluminum nitride, aluminum oxide, silicon carbide and others. Rising consumption of electronic devices and the products usage in pollution control systems will contribute to the monolithic ceramics market growth.